Be it known that I, FREDERICK B. HAMMANN, a citizen of the United States, residing at Baltimore city, in the State of Maryland, have invented a new and useful Toy, of which the following is a specification. 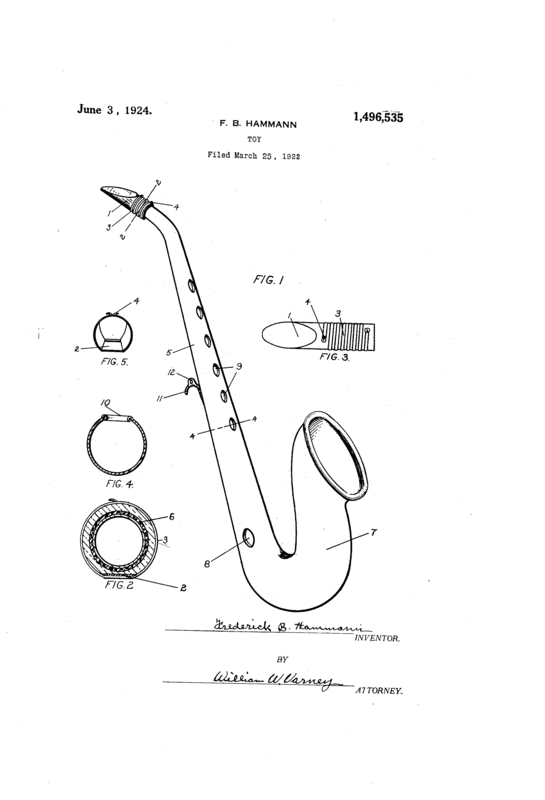 My invention relates to a toy saxophone and has for its object the providing of a reed musical instrument capable of being played without keys with a curved exterior to resemble a saxophone. A further object of my invention is the providing a musical instrument with an extending amplifier on the fixed range of the instrument. A further object of my invention is an improved construct-ion of finger holes to give a flat surface to the finger. 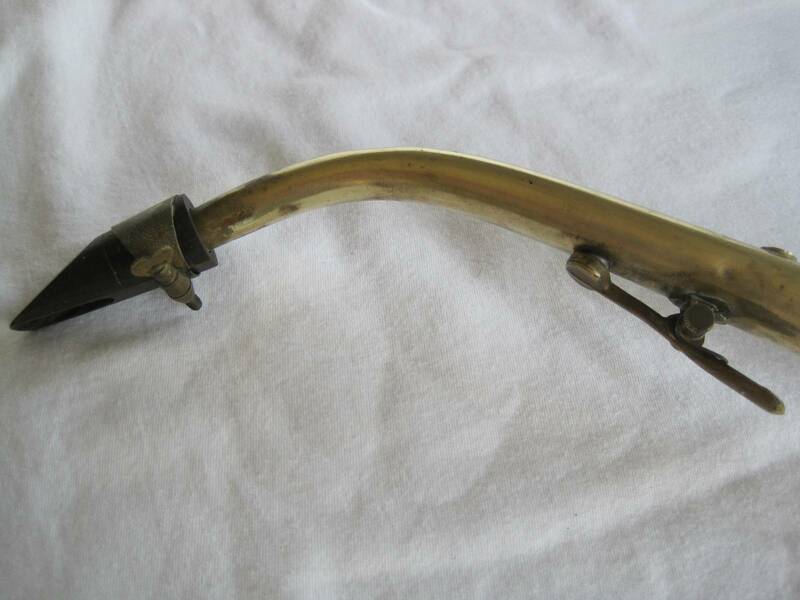 A further object of my invention is the adopting an external reed mouth piece to what is known as a fiageolet. A further object of my invention is an improved means for holding the reed on the mouth piece of wind reed instruments. Perhaps not surprisingly, his little toy saxophone looked an awful lot like the Saxie. 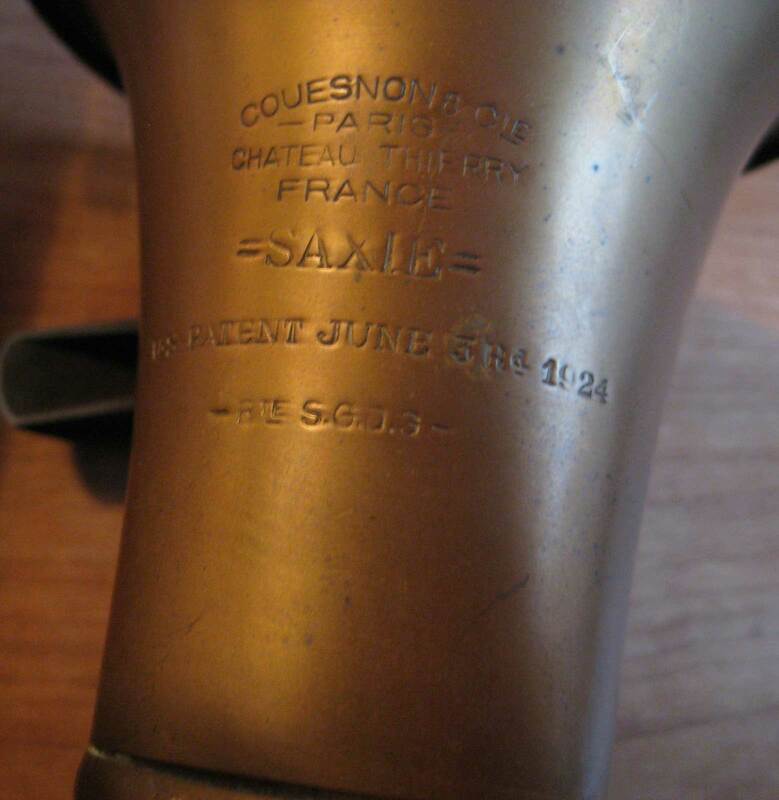 If I was to venture an opinion on the Saxie and other sax-related toys, I’d say they were primarily used as a “gateway drug” into Couesnon’s real saxophones. I also think they were throwing out a lot of ideas to see if any would stick so they’d build some market share in the US. 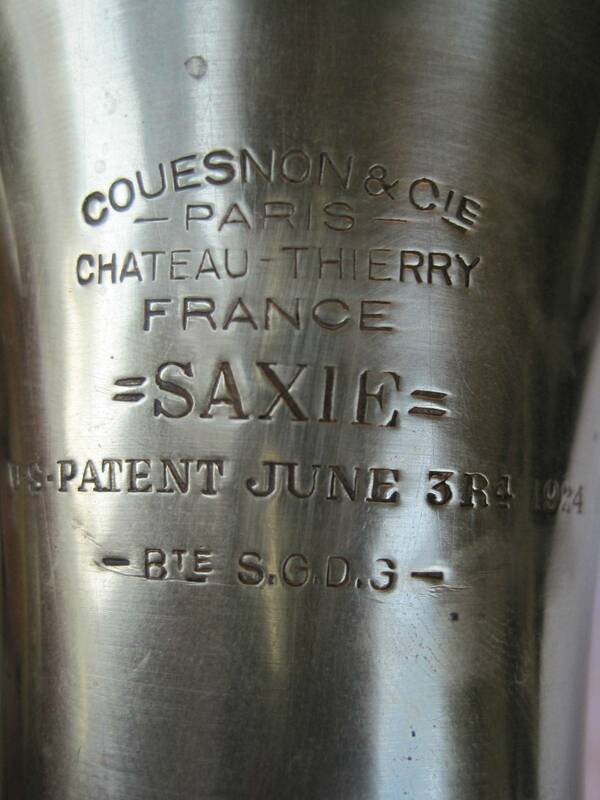 Hey, they were one of the largest manufacturers in France, but the real sax-related money was in the US. I also know that Couesnon more-or-less insisted in their ads that their sax/clarinet/oboe variants were “real” instruments, not toys. 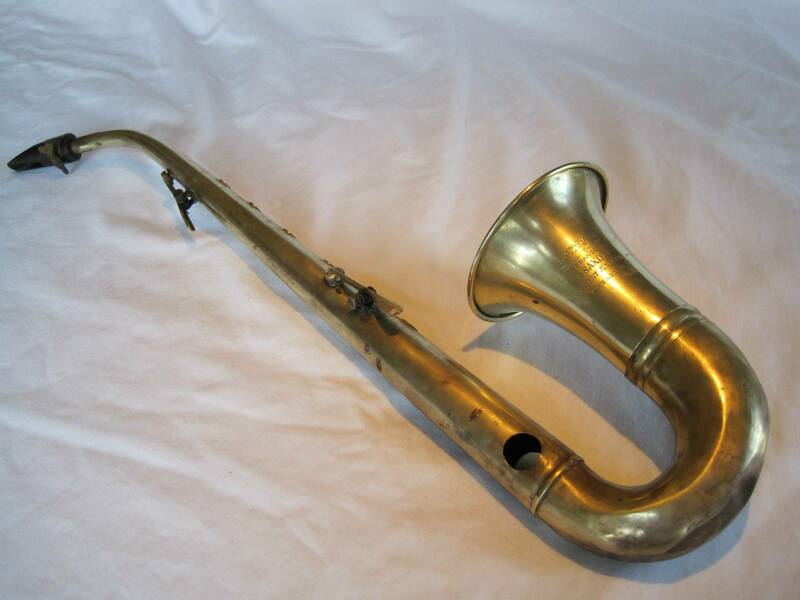 That would make sense, since if you compare the Saxie at the top of the page, to the original patent drawing, you’ll notice that Couesnon’s version has a couple of keys in addition to the open tone holes. But just what do those extra keys do? It is pitched in C and has six tone holes and two keys, an F sharp trill, and a register key. 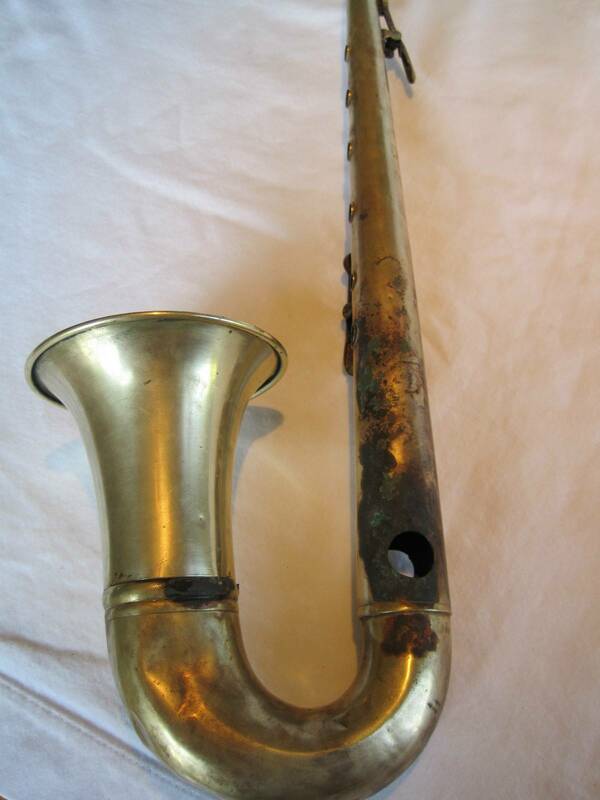 Like a sax, the Saxie overblows on the octave. 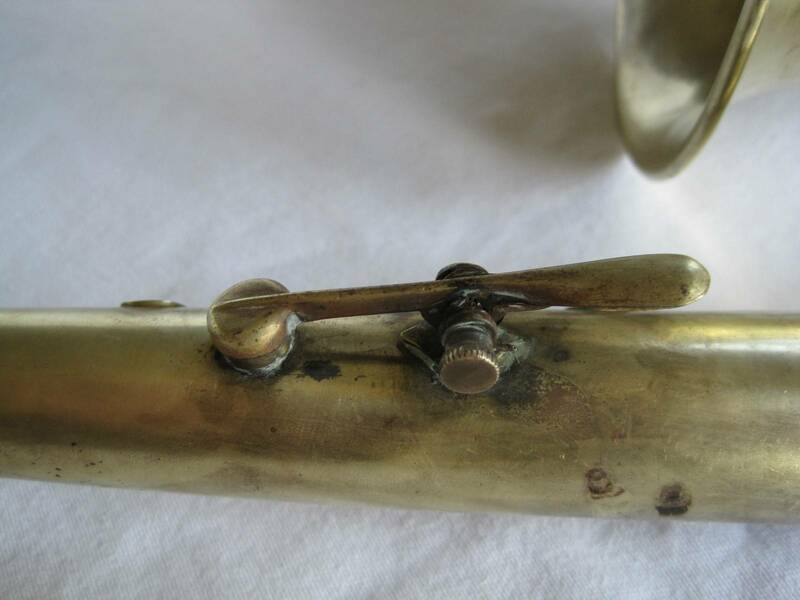 As there are no bell keys, the lowest note being D below the first line of the stave, the instrument is vented by two large holes at the foot, the bell being added purely for appearance purposes. It is manufactured from unlacquered brass and has a brass one-screw ligature. 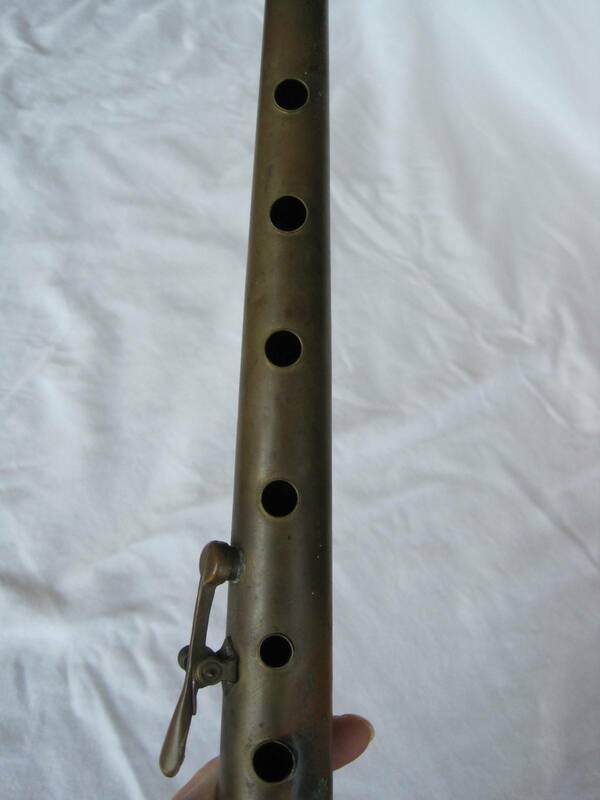 It works well with a clarinet reed and it is assumed this was the intention as these would have been the most readily available to the students for whom this instrument was clearly intended—as a half-way house between the recorder and the sax. 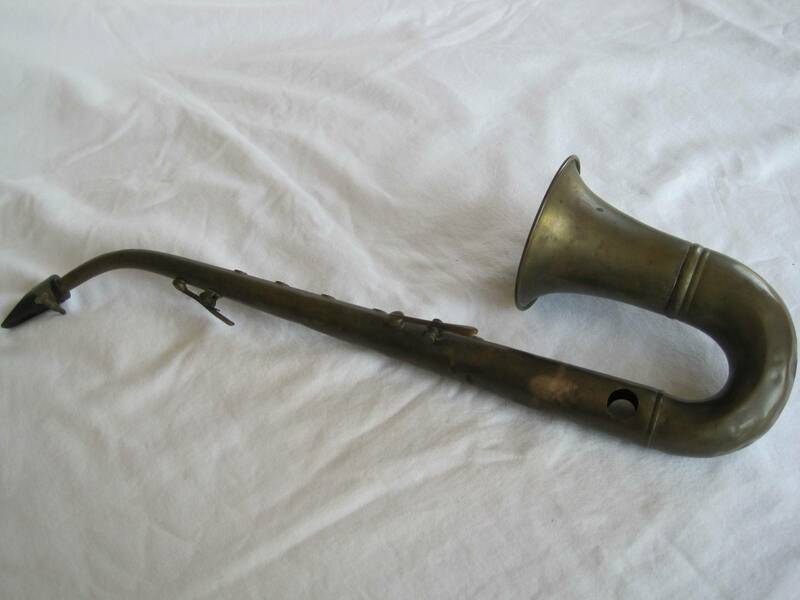 The Couesnon Saxie is quite rare. However despite that, 2 appeared on eBay in the late summer/early fall of 2012 in very rapid succession. I think the first passed under the radar of most people. It sold for a mere $160.50. 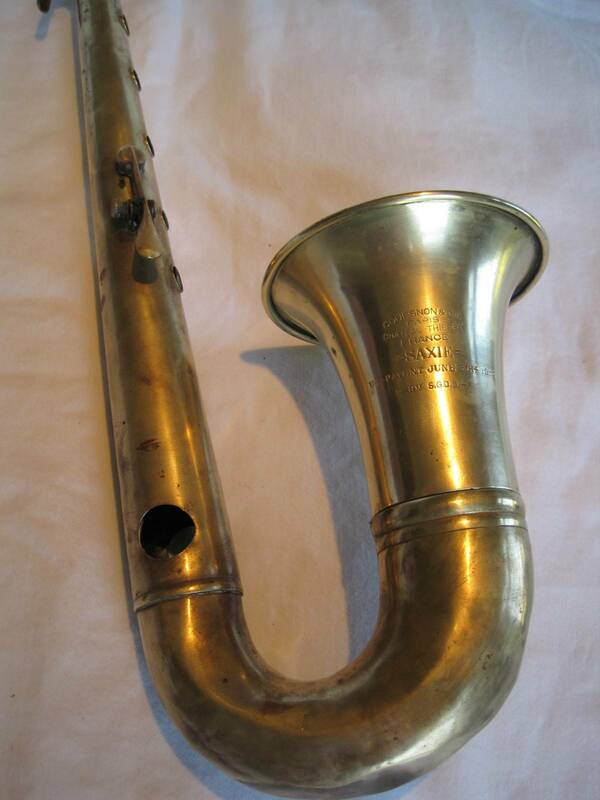 The second Saxie garnered more attention, and a much higher price. It sold for $469.00. It should be noted that it was dent and solder free however. 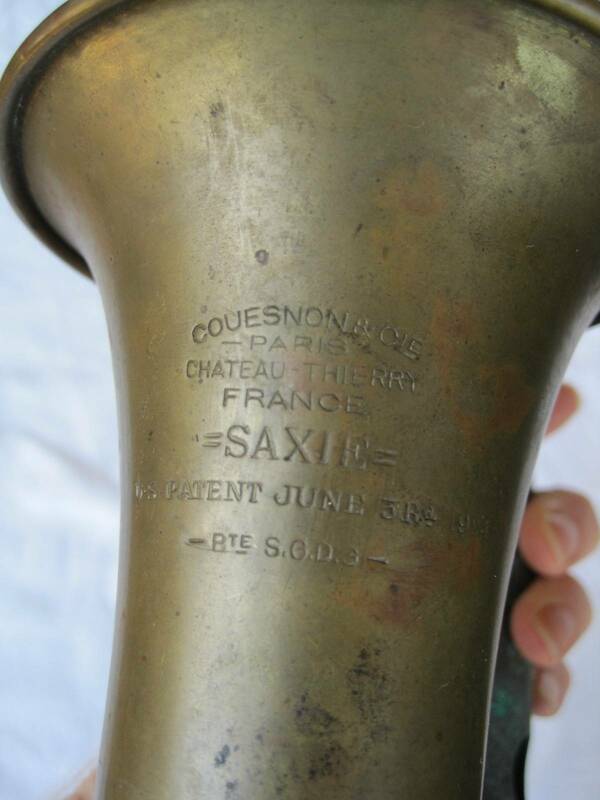 In June 2014 the following Couesnon Saxie appeared for sale on eBay. Although it had a couple of dents, it still sold for $250.00. 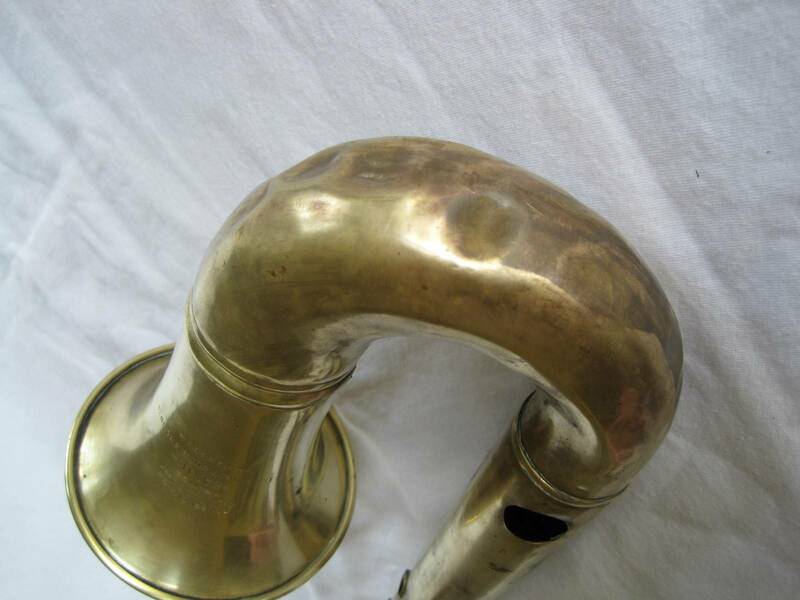 However, the dents are pretty minor, and the horn is decent shape otherwise.